Of course, I'm knitting like a crazy person. Ill also be sewing some quick gifts. I have been working on knit vests for the younger grandkids. I should finish the last one in time. Knitting - I still have to make a pair of Fiber Trends clogs. Sewing - I have 6 pairs of flannel pj pants to make. For my birthday, DH gave me tickets to see "The Christmas Story" at The Cleveland Play House. It was a fun night. The narrator was grown up Ralphie. We'd seen the movie, so knew what was coming, but it was a little different on the stage. This is the last time it will be seen at this venue, since the Playhouse is closing their huge complex and downsizing to another location. They will be sharing theater space with other groups, which makes sense, but sure breaks tradition. Cleveland Clinic has bought the present site. The youngest ones take part in a Sunday School Christmas program. 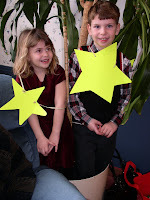 This year they told a story of how the star over Bethlehem was picked. All the children were stars. These are my favorites, taken at the reception following. They're standing in the pot for the tree, silly kids. You could see the faces this year! Last year the littler one was a cow with a hood. I had trouble even later, recognizing her. That was a more traditional story with shepherds, animals and wise men. I think there were more kids too. Two more days of work and then my shop closes for the rest of the year. I may be in there sewing gifts, but I can spend a lot of time with DH and doing house stuff.